The Floyd 3-Seater Sofa is a contemporary upholstered sofa that ships to your door and features simple assembly and disassembly. 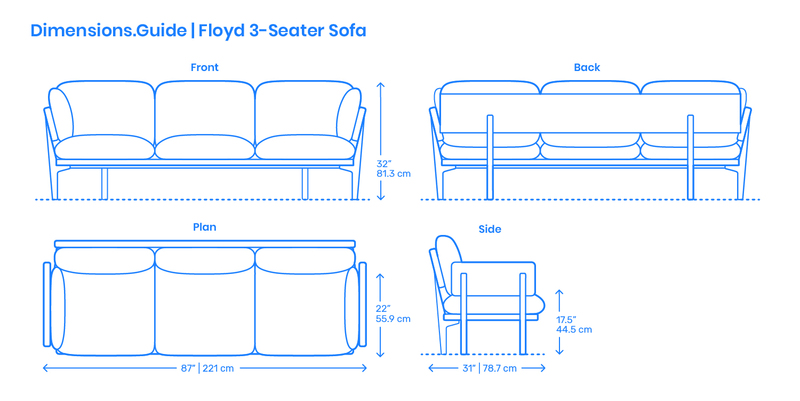 Great for people who constantly move to new cities or switch apartments often, Floyd designs their sofas to break down into a handful of durable and quality components. The Floyd 3-Seater Sofa has a width/length of 87” | 221 cm, depth of 31” | 78.7 cm, and height of 32” | 81.3 cm. The seat is set at a height of 17.5” | 44.5 cm and a depth of 22” | 55.9 cm. A chaise lounge option is available for the 3-Seater.